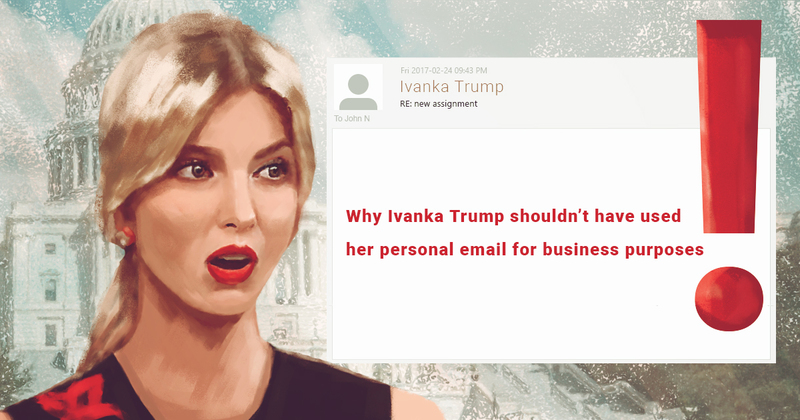 According to the Washington Post, last year Ivanka Trump, the daughter of the President of the United States and in addition senior advisor of the White House, sent hundreds of emails regarding government activities via her personal account. Most of the emails were addressed to the aides and included much of the confidential information. This caused alarm among the White House officials. The reason is that in 2016 Donald Trump personally criticized Hillary Clinton for carrying out email correspondence through her private email server. And now his daughter is doing almost the same. Based on the situation described above we can make a conclusion that no matter what business you are engaged in, email communication can’t be performed through your private channels. Here is why in more detail. Meet Jason, a founder of some company that has no its own email domain. He spends hours contacting his clients to build an ideal portrait of his product’s customer. At the same time, his partner Emma is working hard to attract investors to promote their business. After having emailed a hundred of clients, Jason writes a report and forwards it to Emma. At first sight, everything seems ok. But the name of Jason’s ex is also Emma. He chooses a wrong address from suggested ones and the report with customers’ personal data goes directly to the wrong hands. By mistake. However, it is not a simple mistake. If you disclose your customers’ information to third parties, you break the law (e.g. General Data Protection Regulation in Europe), and chances are you’ll have to stand trial for doing so. Tip: be attentive if you still use your private email account for business purposes. Or create a corporate account with a corresponding domain to avoid email address suggestion traps. You might think that sending emails from your personal account helps build trust with customers. That’s not true. It is not some kind of personalization because personalization in emails works differently and has nothing to do with your email address. If you work day and night to build and promote your own brand, you should do everything possible to achieve cohesiveness. Every element of your business and product must reveal the same values. When the customers notice that your partner, support manager and you are all sending emails from your personal email accounts, they will think twice whether to trust you or not. Because it creates an impression that you all work separately, although the product is the same. Tip: be a coherent whole. Nevertheless every employee in a company and you are working to achieve the same goal, using different email accounts displays absolutely opposite to the customers. There is a huge difference between corporate and private email systems. While private email accounts are meant to simplify communication between family members and friends, corporate-based systems are targeted at business and communication within your corporate firewall. Corporate emails carry more value than the photos from the last night party sent to your sister. Agree? Corporate emails must be consistent, grammatically correct and have no spelling errors. Personal emails can be written in any way. Tip: everything is simple, just distinguish between personal and business correspondence.